I realized that the execution of a watercolor painting was actually more difficult than for other medium. Swift execution of the water color strokes was key. The colors in a successful watercolor painting were actually merging naturally when they were still wet – something which would not occur with an oil painting. And in creating a watercolor painting, an artist have to work from light to dark, because watercolors were meant to be transparent. This meant that mistakes could not be easily covered up, unlike oil on canvas, where the opaque oil could easily be used to painted over a mistake. A watercolor artist have to master many other techniques – composition, wet-on-wet, wet-on-dry, dry brush, drawing, color mixing, brush strokes, selecting materials, stretching paper, masking and many others. Looking at other artists’ work was also a learning experience. I picked up many tips and techniques by subscribing to Artists’ Magazines and reading about other artists’ work. After a while, and after having qualified as a licensed 1st class marine engineer, I decided to quit sailing, and try my luck working on shore. That was quite a trying time, working on construction projects as a Boiler Plant Commissioning Engineer for a large power station at Kapar, Malaysia and later as a Field Engineer working at another engineering construction project for a chemical processing plant at Prai, Malaysia. During this time, I did not get involved with much art activities because it was quite a hectic life. I had to relocate far away from home, and sometimes worked late at night in haphazard conditions of heavy engineering construction sites. Following the construction jobs, I managed to join Intel Technologies, Penang, Malaysia. That was the time when I managed to stay at my home in Butterworth, Malaysia. This was a time when I managed to take up art again. A few watercolor paintings were produced at this time. I also exhibited at the Penang Art Gallery & Museum, Penang, Malaysia in 1994. Later, I joined Baxter Healthcare, also in Penang, Malaysia. By this time, I would say, my art was gradually getting better and better. I would frame up my paintings and hang them all over the walls of my home. Comments from the visitors to my home were quite positive. In 1995, I joined Cofreth, in Kuala Lumpur, Malaysia, handling service maintenance of high rise buildings and shopping complexes in the Klang Valley, Malaysia. There were a few paintings done during this time. 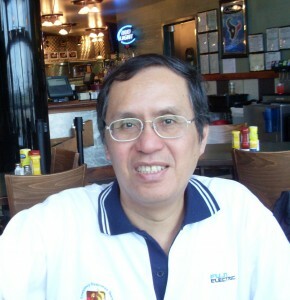 In 1999, I went back to Butterworth, after having found a job at Fuji Electric, Kulim, Malaysia. At that time, the internet was making its presence felt, and I became interested in it. I created a few websites, namely Marine Engineer World, Free-Engineering.Com and Cartoon Web Services during this time. No paintings were done during this time.